The true poison frogs (family Dendrobatidae) are a wide-ranging group of amphibians that occur throughout parts of Central and South America. While there are other “poison frogs” in other parts of the world with similar coloration and toxicity, such as frogs of the genus Mantella from Madagascar, these species are not close relatives of dendrobatids but have evolved similar traits independently in an amazing case of convergent evolution. 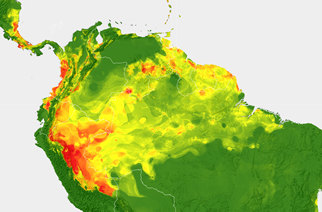 Poison frogs occur throughout parts of Central America (south of Nicaragua), the Guiana Shield (including the Venezuelan tepuis), Chocoan Colombia and Ecuador, and nearly the entire Amazon basin. Species richness is particularly high in Pacific Colombia (the Choco), Panama and Costa Rica, Andean Colombia, and the east-Andean foothills of Ecuador and Peru. 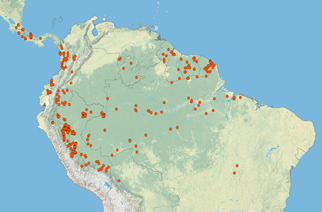 Many other species occur throughout the Amazon basin in Brazil and the Guiana Shield, although diversity in these regions is not particularly high. Approximate distribution of the subfamily Dendrobatinae. Most species in the subfamily are represented by at least one dot. Generalized ecological niche model showing areas of suitable habitat for poison frogs. Warmer colors indicate areas of high habitat suitability.